TM 5-6115-628-14&P WARNING To avoid risk of injury or death by electrocution, do not remove switch box rear cover while either power unit is still connected to switch box. (1) Removal. 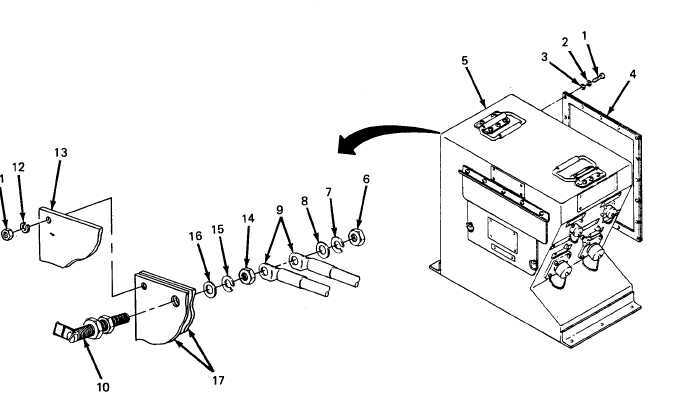 (a) Remove 18 screws (1, figure 4-16),18 Iockwashers (2), and 18 flat washers (3) securing rear cover (4) to switch box (5) and remove cover. (b) Remove one nut (6) one Iockwasher (7), one flat washer (8), and remove associated wires (9) from load terminal (10). (c) Open power output cover and remove six nuts (11) and six Iockwashers (12) and remove load terminal protective cover (13). (d) Remove one nut (14), one Iockwasher (15), and one flat washer (16) and remove load terminal (10) from terminal board (17). 4-32 Figure 4-16. Load Terminal Replacement.